KEEPER OF THE SNAILS: Roast Books: 'Little Roasts' and an interview with the publisher Faye Dayan. Roast Books: 'Little Roasts' and an interview with the publisher Faye Dayan. Tonight I decided to give myself a treat. 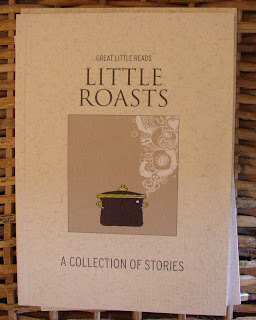 I finished reading 'Little Roasts': a collection of short stories sent to me by Roast Books. It's an eclectic selection of stories of varying lengths - each one shorter than the one before. The first, Brian, McMurphy and Sally too by Rowena McDonald was based in Montreal and dealt with the effect a life model called Sally has on the lives of two artists: Brian and McMurphy. The writing was great, the characters had a convincing vitality, and I enjoyed the story very much indeed. The second, 'A Sop of All This Solid Globe' by Keith Scales seemed to me to be a comic study on insularity. A Visiting Lecturer with 'an accent' comes to visit a farming community in the US. The professor is important in his field; but his field is unimportant to this community. The teacher asks her students to name a Shakespeare play and one of them responds 'Moby Dicks?' The 's' is the perfect finishing touch, I feel. Keith Scales has also written The Cloverleaf Development (also in Roast Books) and I intend to read that next because having read this sample I would like to read more from this author. Circling by Mark Kotting was about a London taxi cab driver (which is Kotting's day job). He circles London picking up fares, and it was fun recognising the places. I liked the terse style of this writing. His last fare turns out to be a particularly poignant one, and Kotting ends the story in just the right place. The last, very short story, Rudimentary Mathematician is by Nikhil Panndhi who was born in Delhi in 1992, and so is still a teenager. She uses unusual elaborate language with a touch of magic realism to tell and interesting story about a grave digger. It is a suitable exotic ending for a successful collection. Each story seemed to have a similar sort of energy, although quite different in tone and style. I enjoyed reading each of them very much. 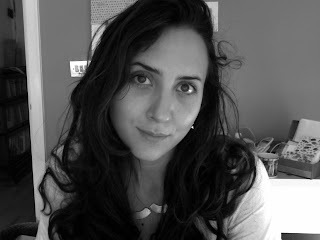 The publisher behind Roast Books is Faye Dayan, and she kindly agreed to be interviewed about the project. CD: Why did you start roast books? FD: I was interested in the idea of literature that was suited to the modern lifestyle, reading for on the spot entertainment. Contemporary novellas are ideal for this, and I think it’s a really underappreciated art form. With the novellas, our next project, An A-Z of Possible Worlds, by A.C Tillyer, Roast Books is trying to present quality literature in a fresh and innovative package. CD: What market are you aiming for? FD: Great Little Reads really has something for everyone, as the novellas are quite diverse. Selling Light and the Profit have quite a universal appeal, both being commentaries on the modern world, whereas Lizard is popular with younger female readers. The texture and feel of the books is designed to appeal to those who seek character in the book itself. The new ebook technology is fantastic, but in a way I think it could be also nudging readers to reconnect with the physicality of the book as a beautiful object. CD: I really like the coffee theme - the website with its coffee percolator and the 'list of ingredients'. What made you think of that? FD: Well, in line with the idea that some of us have less time these days to select a book, the list of ingredients outlines some of the main ‘flavours’ in the book, without giving too much away. It also sets the scene for the idea that the novellas are perfect to read in a coffee break or a lunch hour. Actually it was the author of Lizard, Leonore Schick, who came up with this idea, in an intense conversation about coffee, cooking, and reading. CD: How did you find your authors - did you advertise? FD: Yes, I ran a nationwide competition through writers groups, online forums and magazines offering publication as the prize. We had entries from writers of all ages, published and unpublished who wanted to find a home for their novellas. CD: What do especially look for in a short story? FD: Well actually I don’t thing that there can be a set list of ingredients! But quality of writing and originality are very important. With a novella especially, I think a really difficult thing can be balance and pace. CD: The general design of the books is very attractive - I especially like the idea of the flap, and only ever seen that on overseas books before - how did you come up with the design? FD: Actually I was inspired by those amazing Parisian bookshops. They always have these huge tables with books laid out, so that you can handle them all more easily. And the flaps are convenient to keep your place when you’re on the move with your Great Little Read. CD: I also like the cover pictures - how do you come up with them? FD: Kenneth Andersson is the Scandinavian illustrator who worked with First Presence design and Roastbooks to create the book covers. FD: Actually, I don’t think I’ve ever ‘encountered’ one, looked in the eyes and really acknowledged it. Unlike the character ‘Briege’ in Selling Light, who has an affinity to underappreciated species. FD: well, about a week ago I managed to beat my dad in scrabble by scoring a 7 letter word on a triple word score with the word ‘seceded’ which I am still gloating over – does that count? FD: Yes actually – visiting Morocco for the first time. FD: There’s a Japanese movie called dolls (Takeshi Kitano) which is a movie that probably made me cry the most. But it’s a very beautiful film. FD: List of Ingredients: family, white wine, receiving letters, work, not working, having time to paint my nails, ignorance, knowledge, new pens. FD: Make sure I’m not sleepwalking, then open my lap top. Do you literally mean that each story is shorter than the one before? If so, is that for some effect, or just the way it happens to be? Yes, literally, shorter: 27, 15, 7, 3 - almost a geometric progression (or regression! )...I don't think it was for some effect - but I did like it. It was somehow satisfying. The book seems delightful as does Ms. Dayan. How many pages do you think you read a month, Clare? How many complete books? You seem to have a voracious appetite for reading. I am a bit envious. Not enough, Jud! I have read a lot of short things recently -I think this might give a misleading impression. This is a great interview, Clare. Faye was very kind to send me a set of Roast Books for review and I was delighted when they arrived, all nicely wrapped with a hand-written card, just like a birthday gift! 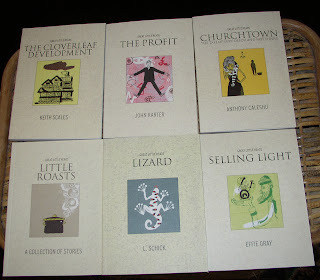 I sincerely hope that Roast Books -- and its authors -- reap much success. I've seen these reviewed in a few places, and they look great. I need to get my hands on a couple. I think this kind of little book is a great bag book - something to have with you at all times in case you get stranded somewhere with no other reading material - which isn't to say they should be a last resort! Yes, I read one of these novella and haven't got round to reviewing it yet, but it was really good. I highly recommend. China: part 1: 'Work on Stuff that matters'.